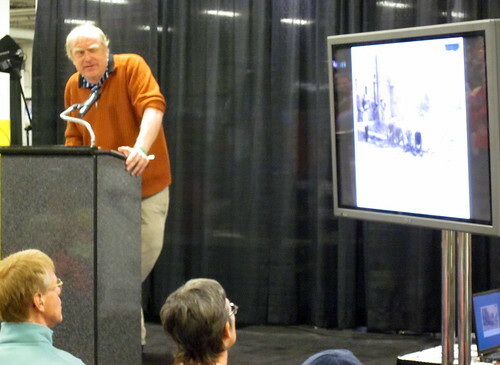 When I talked with him at the Seattle Bike Expo on Saturday, Herlihy said he's been working on another book. This one is about French cyclist Octave Lapize, one of the early winners of the Tour de France. “Lapize was the best all around cyclist of that pre-war era. It will be his story and his generation of cyclists,” Herlihy said. All three winners of the Tour de France during that four-year period — 1907 to 1910 — met tragic ends; they were killed in World War I as members of the French Army. Of this group of cyclists and war casualties, Lapize is the best known. He won the Tour de France in 1910, the first year it included stages in the Alps. The stage in question was 202 miles long, included seven climbs, and the cyclists raced on single-speed bicycles. Lapize was the first rider to summit the mountain that day; he's memorialized by a large statue of him gasping for air. Herlihy's previous book, “The Lost Cyclist,” is mainly a biography of Frank Lenz who set off on an around-the-world journey in 1892. But to properly tell Lenz's story, Herlihy also writes about other topics that connect him with that era. Lenz has connections with penny-farthing racing, “safety” bicycles, pneumatic tires, and early photographic techniques. Even the massacre of Armenians in the Ottoman Empire becomes part of the Lenz story. It sounds like Herlihy's research into Lapize also is taking him off on interesting sideroads. For instance, Lapize had to interrupt his career to fight in World War I. He became a pilot, and Herlihy mentions the strong connection between cycling and early airplanes that includes the Wright Brothers, who owned a Dayton, Ohio, bike shop before developing an airplane. Lapize was shot down on July 14, 1917; Francophiles will recognize that as Bastille Day. He died several days later. Lapize was not alone among cyclists who died during World War I. François Faber, a Luxembourg cyclist who won the Tour in 1909, died fighting for France in 1915. Lucien Georges Mazan (aka Lucien Petit-Breton) won the Tours in 1907 and 1908 and died in 1917 fighting for the French Army. I'm not sure when Herlihy's next book will be finished. He expects to return to France to do more research on his subject, and he's searching for possible film footage of that 1910 Tour de France. We wish him luck in uncovering lots of new details about these early Tour de France cyclists in what will surely be an interesting book.